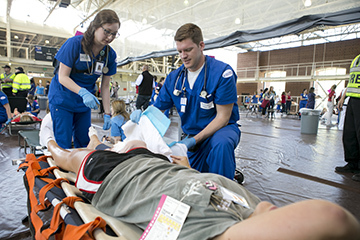 Samford University’s College of Health Sciences simulated an emergency response today to help prepare future health-care providers to respond in the event of a campus or community emergency. In partnership with the American Red Cross, Homewood Fire and Police, Jefferson County EMA, North Flight, and the Regional Paramedic Services, the College of Health Sciences simulated the aftermath of an earthquake resulting in injuries ranging from psychological impact to fatalities. Dawson Memorial Baptist Church in Homewood, Alabama, was set up as an American Red Cross Emergency Response Center. Students played the roles of both first responders and victims, and community partners interacted with the students as they would in an actual disaster. Students gained valuable experience with the patient triage process. Responders encountered victims with a variety of medical situations that could result in the event of an earthquake, including amputated limbs, childbirth, debris inhalation, electrocution, psychological damage and more. A North Flight helicopter was on the scene for students to practice preparing critical patients for air transport. More than 300 students participated in the learning experience, representing a number of programs and departments, including undergraduate nursing, communication sciences and disorders, family nurse practitioner, kinesiology, nurse anesthesia, pharmacy, public health, social work, and university counseling services. Community volunteers, including senior adults from Dawson Memorial Baptist Church and local children, also played the role of victims. According to Jefferson County EMA Emergency Management Officer Horace Walker, the importance of teamwork and effective communication are key takeaways from this exercise. “Students gained an understanding of how this type of event will be managed, the scope of the response and the value of solid communication,” he said. “It is our hope that students leave with an understanding of the importance of team work in a time of crisis and how they can become valuable contributors to emergency response teams,” he added. This is the first year that the American Red Cross has participated in the simulation. To make the response center as realistic as possible, the Red Cross provided supplies and an emergency response vehicle to aid with responder support during the simulation. These services are examples of realistic relief efforts that health professionals would rely on during disaster relief. This is the fifth annual disaster simulation, but the first time the event has occurred off-campus and the first time such a large number of students have participated. The number of student and faculty participants doubled from last year’s simulation, and plans are already underway for next year’s event.